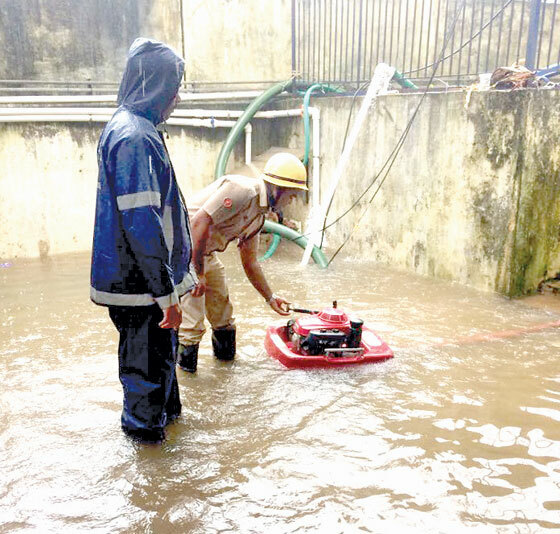 The rains that came down pouring on July 5th of all over Goa swept away all claims of all the authorities of the districts being disaster management ready. The incidents that occurred all over Goa revealed that the disaster management committees and forces of Goa come into picture after the disaster and have not paid any heed to avoid such disasters. Flooding which is common during the rains has happened chronically and perpetually in the same places as always. Trees continue to fall on houses and electrical wires disrupting human life. But the fact is that the authorities were prepared for flooding but not to avoid it in the first place. For a tourist driven state like Goa where the footfall of revellers is 4 times the population having no disaster management plan revealed the deplorable state of affairs in the smallest state of India. The rains on the Thursday hammered the entire state of Goa, to such an extent that there was flooding and tree fall cases reported from the worst imagined areas. The funniest fact is that the helplines published by the disaster management team of South Goa received few calls while the towns and main roads had turned into rivers. Reports of areas like Curtorim market and surrounding locations going under water were surprising for all as these areas have never been flooded. Herald had set out to these areas to find out the condition of interior wards and locales around Margao town. Everywhere it could be seen that there were well built drains and cross drains. But water was flowing over the drains and gushing out of the drains as well. Several drains and rain water gutter were seen choked with plastic and garbage. Roads with footpaths on both the sides were affected the worst. It was clearly seen that these footpaths became dams for the water on the road and flooded the road instead getting the traffic at a grinding halt. This issue was seen at the Navelim road which was totally inundated under the incessant rain water. The state of the new Curchorem junction too was similar. The road has parallel running foot path on its sides which resulted in knee deep water filling up of the roads. The flooding of the Paroda village and the Quepem Margao road in Gudi is an example of how the ignorance of the administration and also the elected representatives takes a toll on the living of the people in the villages. Like every year the Paroda village is submerged under waist deep water. This exposed the disaster management preparedness of the district and also the absence of any planning to avoid it. The Kushawati river flowing through Paroda crossed the danger mark like always. "Thousands of people travel on this road every day. However this road went under water just like every year. The Government as well as the district administration is showing no sign of concern towards us" said villagers of Paroda. Deepak Kharangate the local Sarpanch of Paroda said "Road and bridge submerging under water happens every day. However the bigger worry is of incessant rains and if that happens the village will be under water. But no one is concerned" he said. "The Mamlatdars and District Collector hold disaster management meetings every year. But they have conveniently forgotten this flooding area that occurs every year" said Deepak. "The flooding won’t stop by increasing the height of the bridge. There is a need to increase the height of the road" Kharangate added. As far as Margao is concerned the Margao Municipal Council every year calls meeting of all departments for the pre-monsoon preparedness planning like it did this year. The MMC had warned the Sewerage Department to repair the roads dug up for connecting lines to man holes as MMC informed that there have been complaints from all the Councillors. But sadly even after the Chief Officer writing a strong worded letter to the Sewerage Department highlighting the major lapse on their part the roads that were dug by the Sewerage department were never repaired. A big list of major nallahs required to be desilted was handed to the WRD for execution. But the nallahs overflowed and the gutters too. It may be recalled that the Revenue Minister Rohan Khaunte, who is also chairman of state disaster management authority, had said that there is an urgent need to have a holistic disaster management plan for Goa. However from the duties of the disaster management cells which are prevention and preparedness, response operations, coordination, rehabilitation and community awareness and involvement the very prevention is not being looked into. Even after so many years of trials and errors trees still fall onto houses, vehicles, roads till go under water, and people keep getting inconvenienced. Will Goa have a comprehensive Disaster Management plan for Goa which will concentrate of prevention is what the people affected by the nature’s fury ask. The South Goa Collector Tarik Thomas (IAS) who attended a meeting called by the Secretary, Urban Development today when asked regarding the disaster management said "The ambit of disaster management has been increasing every passing year and now water logging has also been put under the disaster management subject. The Collectorate of South Goa held two meetings prior to rains and today we had a meeting at the Secretary Urban Development chamber to review the situation to tackle floods and water logging" he told. "Under disaster management plan we are now planning to take it up in a systematic manner. We have discussed the matter and now more and more cases of water logging and similar cases we face every year will be mapped systematically and we will work out a long-term solution for chronic water logging areas" he informed. "As far as the tree fall cases in the rural areas concerned there are remedies in place like the section 33 of Goa Tree Act where in dangerous trees can be cut after taking due permissions unless it is made absolutely sure that it is going to call danger two persons or property" he told. When asked about the absence of disaster management plan the District Collector South told "The disaster management plan is a continuous process and needs to be revised continuously. Definitely we are facing certain issues but currently the water logging issues and flooding issues are of utmost priority to us and the meeting discussed about the same issues" he told. When asked whether the District level and Taluka Level meetings of Disaster Management discuss about solutions for perpetually flooding areas the Mamlatdar of Salcete Vishal Kundaikar said "Indeed we discuss regarding the prevention of the flooding in the chronic areas and issue directions to the relevant authorities to take corrective measured to avoid the same. However the problem persists every time" said Vishal.